Pep Guardiola and Jose Mourinho switch sides for Champions League semi-final (Satire) | Make Time For Sports. 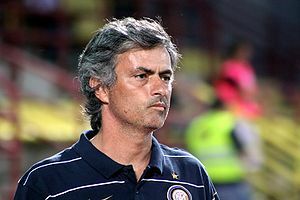 The Union Of European Football Associations (UEFA) has stepped in to resolve the on-going feud between Real Madrid coach Jose Mourinho and his Barcelona counter-part Pep Guardiola. In an innovative solution mutually agreeable to both parties, it has been decided that the two coaches will switch sides for the Champions League semi-final, the first leg of which is scheduled to be played tonight at the Bernabeu. Real Madrid and Barcelona owners agreed to the swap; the two teams would have to cough up exorbitant fines otherwise. This is an attempt by Europe’s foremost soccer body to restore a modicum of decorum to the coaching aspect of the game. “There was a time when coaches would respect each other and enjoy each other’s company after a game, and trade war-stories over a couple of beers.” said a top UEFA official. “Soccer is the ‘beautiful game’ and every facet of the sport should convey its beauty.” continued the UEFA office-bearer. Jose Mourinho is privy to the decision and has agreed to the conditions laid down. Pep Guardiola was more uninhibited in his response. After letting fly a few unbridled expletives, he was persuaded to fall in line by Barca management. When asked if this will affect their performance as coach, both managers had similar responses saying that they know their opponents as well as their own players and guiding them will not be a huge problem. “It’s just a question of turning SWOTs around for each team.” said Guardiola. Pep Guardiola expelled a few more expletives in reply to the same query.